The mission of Grocery Shop for FREE at The Mart is to help you spend as little as possible on the things you need at Walmart. While this blog focuses mainly oncouponing, there are many other ways to save and to get the maximum amount for the money you spend. To that end, we are starting a new series that will cover some of the non-coupon related things that will help you on your shopping trips. 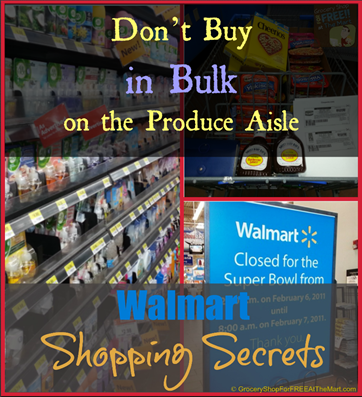 I hope you enjoy these Walmart Shopping Secrets. As consumers we are programmed that deals are better when we buy in bulk. You can get on tube of toothpaste for $2 or get 2 for $3.50. It’s pretty clear what the better deal is there, right? For reasons I can’t begin to understand, these tried and true laws get thrown out the window when we get to the produce area of the store. On a recent trip to the store one avocado was $.58 but a 10pk was $6. 1 green bell pepper was $.68 but a 3pk was $3. There were a few exceptions, buying onions and potatoes in bulk was a little cheaper than buying singles, but don’t take it for granted that just because you are buying something in bulk the price is cheaper. Take a second to do the math and you might be surprised!